There are tons of public and private golf clubs and courses throughout Wisconsin. While the golf season is cut a little short due to our long cold winters, there is no shortage of challenging courses. Check out the well-manicured greens and stately club houses of our top 10 golf courses in Wisconsin. Play on the same course that the Wisconsin Badger’s Golf teams. The course was home to the PGA Championship Tour presented by American Family Insurance. The open front nine consists of preserved prairie and marshland while the back nine offers dense Wisconsin woodland. Whistling Straights Golf Course is one of two courses part of The American Club. Whistling Straights is a luxury 36-hole course located in Sheboygan. They have hosted three PGA Championships and the 2007 U.S. Senior Open. Furthermore, they are hosting the 2010 Ryder Cup—golf packages are already going fast! The Lawsonia offers two very different 18-hole courses noted the Wisconsin Golf Course of the Year and ranked No. 2 best course in the state LINKS according to GOLFWEEK. On top of their great accolades their sister pub, Langford’s Pub, has great food. SentryWorld offers an 18-hole course in Stevens Point. Their rates include the 18 holes, GPS equipped golf cart and practice balls. The course was recently renovated and reopened to the public, offering a new expansive course. Rolling greens, sand traps, and sparkling blue waters. The Wild Rock Golf Course adds yet another great thing to do in the Wisconsin Dells area. Located within the Wilderness Resort, there are 18 beautiful holes for a perfect day on the course. Views of the Baraboo Bluffs from 30 miles out give the course a breathtaking edge on the others. The Brown Deer Park Golf Course is a public course within the Milwaukee County Park System. The history of the course dates to 1929 from its designer George Hansen. 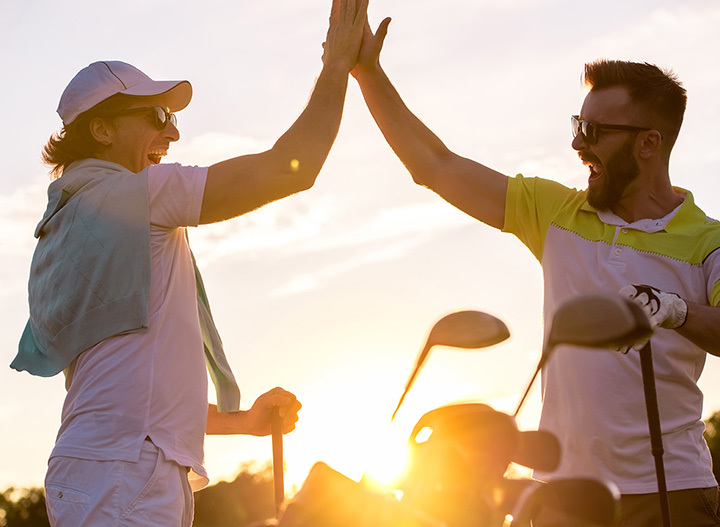 The 18-hole course is perfect for all types of golf players—beginners to experts. The Erin Hills course is notorious for being challenging with beautiful views of the Wisconsin terrain. Golf Digest ranks Erin Hills has the 42nd greatest course overall and the eighth best public course in the nation. Blackwolf Run is the sister course of Whistling Straights associated with The American Club. The Blackwolf Run opened in 1988 and was named in that years Golf Digest as “Best New Public Course.” They’ve hosted numerous professional championships throughout the years. The Oaks Golf Course has 18 great holes at an unbeatable price. Their challenging course has sandpits, dog legs, and a mixture of long and short runs. The Oaks Golf Course was voted Golf Digest’s “Best New Courses.” On top of a great golf course, they have a tasty food selection, and host stunning events. The Timber Ridge Golf Course is the among the Northwoods best golf courses. There are tons of leagues and events going on throughout the week at Timber Ridge so make sure you set a tee time early. Among their beautiful northern Wisconsin scenery, there is a fully stocked pro shop, restaurant, and driving range.